Police are appealing for witnesses after a number of vehicles have been vandalised in the Stonehaven and Inverbervie areas. Between 4.30pm on April 19 and 4pm on April 24, seven vehicles were targeted resulting in damage worth £1270. The vehicles had been parked in the Arduthie Road, Evan Street, Princess Road and Carronhall areas. In addition, between 2.30pm on April 30 and 2.30am on May 1, five vehicles and one greenhouse were vandalised resulting in damage worth £1140. The damage happened in the Montrose Road, Trenchard Walk, Norfolk Terrace and King Street areas. 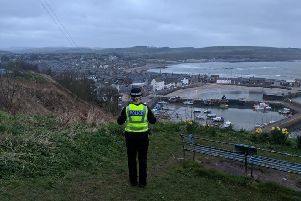 A car was also vandalised at Brickfield Road, Stonehaven, between 12 -13 April. The damage is estimated to be around £400. PC Wayne Smart said: “A considerable amount of damage has been caused to these vehicles which is upsetting for those affected as well as costly. A variety of damage has been caused including windows, windscreens and wing mirrors being broken and smashed and the vehicles have also been scratched.